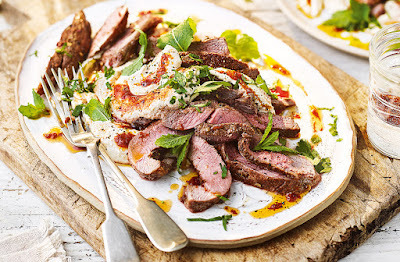 Try something different with houmous by using it as the base for grilled, lightly spiced lamb steaks. This Middle Eastern-inspired dish is perfect for sharing as everyone can scoop up the creamy, yogurty houmous, slices of tender lamb (flavoured with ras el hanout) and final, aromatic harissa oil. Preheat the grill to high. Mix the ras el hanout with a pinch of salt and rub over the lamb. Brush with 2 tbsp olive oil and grill for 5 mins each side or until cooked. Transfer to a warm plate, cover with foil and rest for 5 mins. Meanwhile, mix the houmous and yogurt in a bowl and swirl onto a serving platter. Mix the harissa paste with the lemon juice, remaining olive oil and a pinch of salt. Slice the lamb. Stir a little of the harissa oil through the houmous, then top with the lamb. Drizzle with the remaining harissa oil and top with the herbs.